If you've been following along my blog for a while now then you probably are aware of my love of granola bars. When I did my What's In My Backpack post and video I am pretty positive I had upwards of eight granola bars in there. While that seems a bit ridiculous they are my favorite quick snack to grab on the go without sacrificing nutrition and more importantly flavor. While there are lots of good granola bars on the market my absolute favorites are from LUNA Bar. And, big news my favorite snack bar is now gluten which means virtually everyone can enjoy delicious LUNA bars. To celebrate LUNA has also added a new delicious favor that they sent me to try out. Chocolate Cupcake is the new flavor and it tastes just like dessert. Somehow they were able to get the unique flavor of a cupcake that you can enjoy and snack on on the go. While the Chocolate Cupcake flavor is delicious my all time favorite will always be the Chocolate Peppermint Stick. I probably have at least six in a week if not more! They are the perfect thing to eat between classes and are packed with lots of protein and fiber making them guilt free. This thought aligns perfectly with LUNA's philosophy: Say no to guilt, deprivation, and dieting and yes to intuitive nutrition, pleasure, quality ingredients and, of course, chocolate. How could any one complain about that statement? Along with the new flavor LUNA sent me loads of mini bars in chocolate peppermint stick and lemon zest that I shared with my sorority sisters during midterm week. We all agreed that these were the perfect study snack and the mini bars were especially perfect for taste testing. 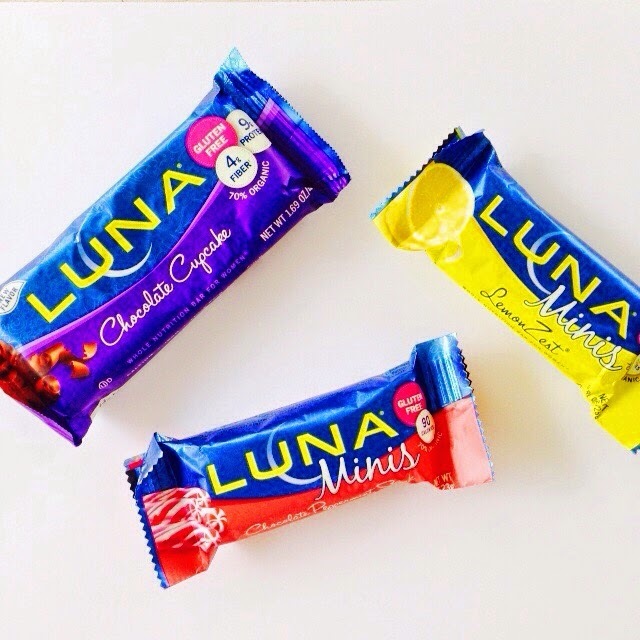 If you haven't tried LUNA bars before then definitely go pick some up, they will surely have a flavor that fits your mood. And be sure to try out the new chocolate cupcake bar and my personal favorite, chocolate peppermint stick or if you're looking for something a bit more refreshing instead of sweet grab the lemon zest bar! I love luna bars as well! Perfect for a on-the-go snack! I've been a KIND bar girl for a long time...but talking about these Luna bar flavors has me interested in trying out theirs!